Gluten-Free Living > Gluten-Free Lifestyle > Gluten-Free Eateries: Which States Have the Most? Gluten-Free Eateries: Which States Have the Most? Since we started building our lists of gluten-free bakeries, cafés and restaurants in 2017, we have been astounded watching the number grow. We wondered, though—which states have the most dedicated establishments? By our count, there are 234 dedicated gluten-free restaurants and 215 bakeries in the United States for a total of 449. Only five states—Alaska, Mississippi, Oklahoma, West Virginia and Wyoming—have no dedicated offerings. 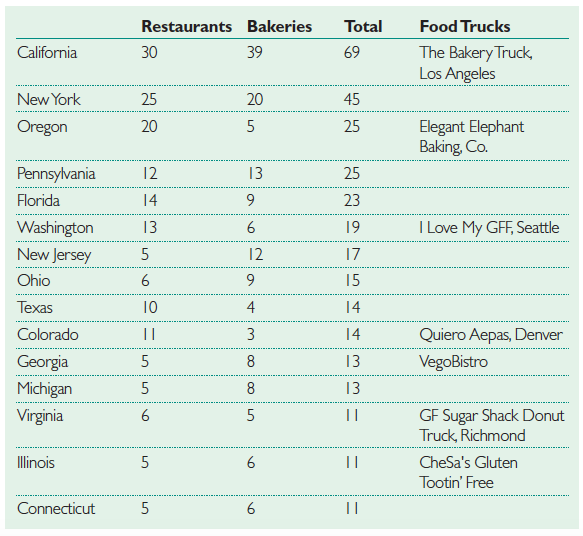 It was surprising to find that almost three-quarters of these restaurants and bakeries are in just 15 states. Adding to the gluten-free fun, out of the eight dedicated food trucks found, all except one reside in these same states. Which state do you think has the most gluten-free bakeries? Or restaurants? My first guess was totally wrong—I thought it was New York, only to see that California has it beat with five more restaurants and a whopping 19 more bakeries. Are you surprised by the totals? Did we miss any? If we’ve missed a dedicated eatery in our searches, please let us know. Find us on Facebook at @gflivingmag or Twitter @gfliving. Please note: Only bakeries with brick and mortar locations are included. Bakeries and restaurants with more than one location are counted individually. Grabbagreen restaurants have been removed due to the use of a wheat tortilla at some of the independently owned franchise locations.